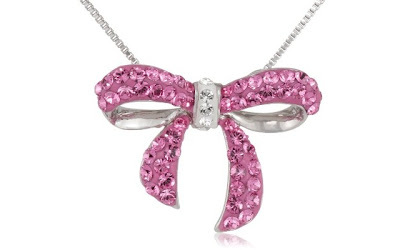 This Carnevale Sterling Silver Pink Bow with Swarovski Elements 18" Necklace is currently selling for just $45.00 on Amazon.com! You will be saving 70% off the listed price of $149.00 with this jewelry deal. What I like about this ribbon necklace is how elegant and feminine it is. Sometimes a girl feels bold and edgy, but this necklace is for when she feels especially girly.